The Home Office was warned about fears of a "scam" over migrants 18 months ago, according to the Tories. A British diplomat in Bucharest has been suspended for claiming migrants were allowed to stay in Britain despite warnings about flawed applications. As MPs debated the issue, the Tories published letters to the Home Office raising fears about forged claims. Home Secretary David Blunkett says it is ridiculous to suggest that ministers would have approved of such fraud. Pending an inquiry, he has now suspended all immigration claims from Romania and Bulgaria made under the European Community Association Agreement (ECAA) - a migration scheme for prospective business people from some countries outside the EU. The latest allegations broke when James Cameron, a consul in the British Embassy in Bucharest, e-mailed Mr Davis with his concerns. Mr Cameron has now been suspended but his letters feature in the new Tory dossier. In October 2002, he told an immigration officer at Heathrow that the Home Office was approving business applications from people not thought up to their supposed trade, including a one-legged roof tiler and an electrician who had lost his fingers. In a Commons debate on the issue, Immigration Minister Beverley Hughes said Mr Cameron had discussed his concerns with a senior Home Office official days before e-mailing the Tories. She said a report was given to ministers of that meeting, which suggests ministers were aware of the problems before they were raised by the Tories. But MPs also heard that Mr Cameron had been assured his fears would be investigated. Facing calls for her resignation, Ms Hughes said her conscience was clear. "I am neither incompetent nor dishonest and I intend to carry on doing my job as long as the prime minister and the home secretary want me to," she said. Downing Street says Tony Blair "absolutely" has confidence in Ms Hughes. 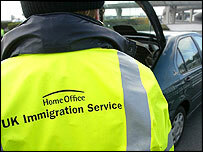 A Tory no confidence motion in the government's immigration record was defeated by 378 votes to 156. Shadow home secretary David Davis went to the debate armed with concerns about the ECAA scheme sent to the Home Office since October 2002. In November 2002, senior Foreign Office official John Ramsden wrote to Chris Mace, the deputy director general of the Immigration and Nationality Directorate saying that Britain's entry controls were being "completely undermined" by an "organised scam". The letter came after Mr Ramsden had visited Bulgarian capital Sofia. Mr Davis told MPs there had been a "catastrophic" failure in the immigration system. He said the new documents showed civil servants had been told to do things they believed to be improper or illegal. The correspondence painted a picture "of hard working civil servants struggling under impossible burdens", Mr Davis continued. The Tory spokesman added: "Somebody, just somebody, should shoulder responsibility." Mr Blunkett described the allegations as "extremely serious" and said he was setting up a hotline for immigration staff to report their concerns. Officials were now heading for Romania and Bulgaria to investigate the claims, he said. Mr Blunkett and Ms Hughes clearly did not condone fraud. "How on earth can you blame the minister of state [Ms Hughes] for actions in relation to failure to follow through on allegations of the magnitude that have been alleged?" said Mr Blunkett. In a robust defence of his minister, the home secretary said: "The Sunday Times, the Tory party and anyone else can keep on throwing mud but my right honourable friend is not resigning, she's not being sacked..."
Last week an internal inquiry found a decision to waive checks in Sheffield on ECCA applications from eastern Europeans had been taken by junior staff without ministers' approval. Liberal Democrat spokesman Mark Oaten said that inquiry showed officials were either not given proper guidance on policies, or that policies were changing so fast they could not keep up. Mr Oaten said he did not back calls for Ms Hughes to resign now, but he said there should be a full independent investigation. "Warnings about dodgy applications were simply brushed aside"
How serious are visa scam revelations for David Blunkett? Is Britain's immigration system working?